To keep the reno within budget I have had to cut down on all the extras and special details I want (you'd think I'd asked for gold plated walls). It's a shame but I'm treating it as a challenge to design and decorate with some smarts about me. Unfortunately the dream range cooker had to immediately go. Read about it here. But I managed to score myself a gorgeous Viking direct from the wholesaler for $6700 less than the Lacanche. It's a rarely seen brand in Australia but I know in the States you either choose a Viking or a Wolf. The Viking has open burners and a tray under the hob so all the mess that spills over onto the cooktop just lands on the tray underneath. Just pull out the tray, replace the foil and voila a clean stove! Another great feature is the oven. It's a 90cm range but the oven is massive! Biggest than anything I've seen by far. I love the depth of it too. At 70cm it's a proper commercial size and feels so solid and tough. The very kind guy at Anolon Imports also showed my friend and I this beauty. A 1.8m La Cornue, royalty in the cooks world. Hence we took photos. It was stunning! But really - who has room for a 1.8m stove? So now with the slight change in style of the stove, I've been thinking how the kitchen design will work into that. Cue many nights falling asleep thinking of splashback materials, open shelves, rangehood designs....My brain just won't stop. I came across this picture on Pinterest. 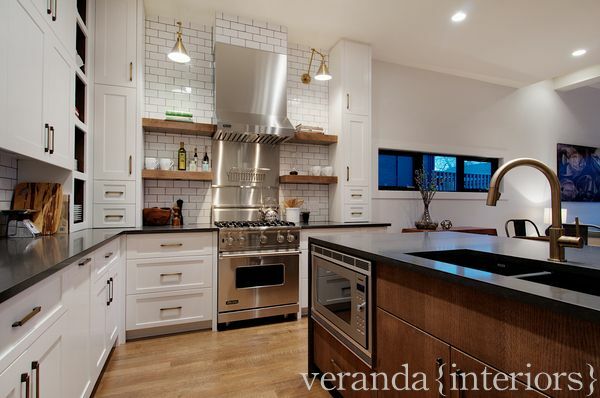 I was drawn to the open shelving around the rangehood. I'd already planned to do that. But the lighting I was impressed with. What a quirky feature and a great way to show off the ceiling height. So that's a big tick. I will probably add another wall light over the sink. I also like the brick pattern tile but wait, our house is MADE of brick. Why tile when you can expose? 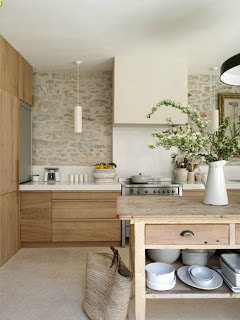 I love the rustic look of this. It's such a gorgeous kitchen. 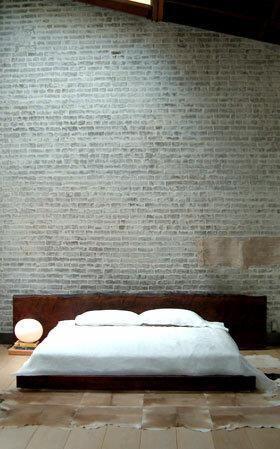 Of course, our brick would look more like this with a white washed effect. What do you think? Am I travelling in a good direction here? It's hard doing a design job for yourself!